Review: We were thrilled to bits with last year's "Passage EP", a two-track debut from Lars Bartkhun and Armon "Aybee" Bazile's The Astral Walkers project that offered a near perfect fusion of the former's jazzy musicality and the latter's deep and cosmic production style. 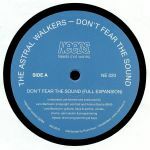 "Don't Fear The Sound" explores similar sonic pastures, throwing in nods towards disco, boogie and jazz-funk to ensure an almost overwhelmingly positive listening experience. This is best exemplified by the A-side "Full Expansion" version, where eyes-closed guitar solos and breezy, carnival-ready pianos ride loose-limbed live percussion and a seriously warm bassline. Over on the flipside, they serve up a spacey and intergalactic deep house revision (the "Astral Stroll" mix) that's a little less hectic despite rocking a peak-time friendly BPM.